Hyles churkini Saldaitis & Ivinskis, 2006, Acta Zoologica Lituanica 16(4): 317. Type locality: Mongolia, Gov'-Altai Prov., Mogoin Gol (River), 1920m alt., 45°39'N 93°47'E. Note. Although treated as a good species here, it is possible that this taxon represents a natural hybrid between two of the several other species of Hyles which occur in this area. Initial results of mtDNA analysis indicate that the maternal ancestor of this taxon was/is Hyles euphorbiae euphorbiae. Wingspan: 68-70mm. The appearance of the new species is typical of the genus Hyles. 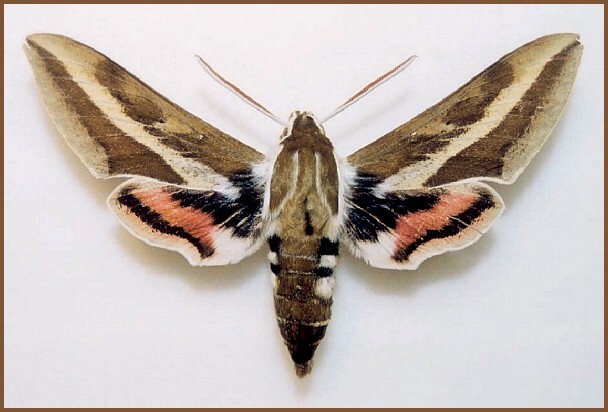 Going by its size and wing pattern, the species is closest to the Hyles�euphorbiae species group. 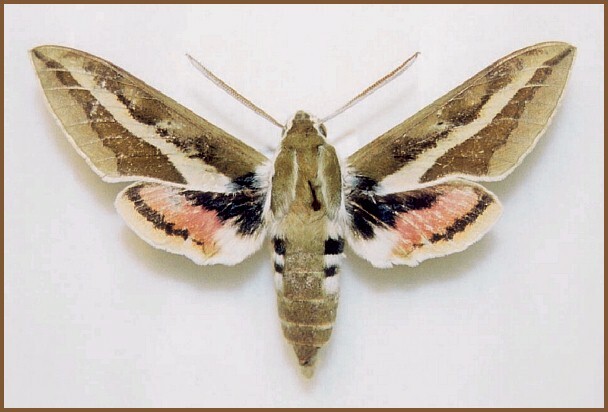 The characteristic features of Hyles churkini are as follows: antennae comparatively long, their length nearly half the length of the forewing; tegulae dorsally with a white indistinct margin; lateral black & white abdominal bands so characteristic of the genus Hyles are narrow (the first black band is 2mm long); forewings low-contrast, with a typical wide subcostal area having even edges and not reaching the apical wing margin; spot of subcostal area is not prominent and almost merges with subbasal spot; subcostal area is continuous with inner margin, fairly regular and straight; median fascia narrow, comparatively dark, and yellowish brown; wing veins in median line area weakly developed; the upper side of hindwings is the same as in other Hyles species, whereas the underside has a distinct narrow overmedian band (Saldaitis & Ivinskis, 2006). Genitalia typical of the genus. In the male, valva very wide and rounded apically. Harpe is wide basally, visibly narrowing after 33% of its length, sharply pointed and slightly incurved. Vinculum at the distal end is wide, nearly right-angled. Aedeagus straight, with a deep, distal sclerotised indentation, especially strongly sclerotised ventrally. Apex of aedeagus forms a serrated curved plate. Vesica wider basally than aedeagus, with apical diverticulum (Saldaitis & Ivinskis, 2006). The new species was collected together with two other species of Hyles, namely Hyles euphorbiae and Hyles exilis. 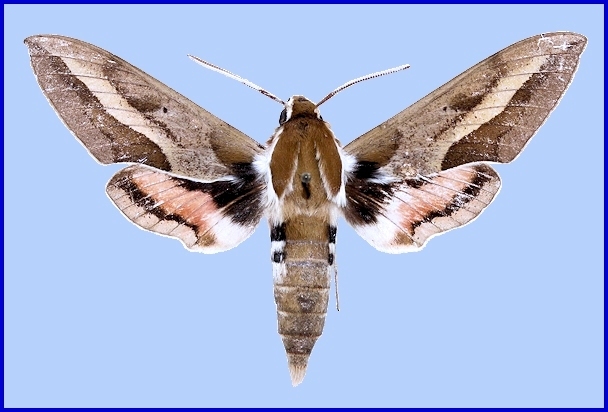 It differs from Hyles�euphorbiae in its tegulae (white margin is diffuse in Hyles�euphorbiae), black & white abdominal bands (those in most specimens of Hyles�euphorbiae are wider, the first black band is 3mm long) and in wing pattern (subcostal area in Hyles�euphorbiae is not continuous, has two separate spots, with subbasal spot well developed, median area is yellowish grey, overmedian band on the underside of hindwings is not prominent). Genitalia differ in the shape of harpe (in Hyles�euphorbiae, it is elongate, nearly straight and gradually narrowing, vinculum wide and distally rounded). Hyles churkini differs from Hyles�exilis in its tegulae (those in Hyles�exilis with a very distinct, bright white margin), black & white abdominal bands (those in Hyles�exilis are wider, the first black band is 2.5-3mm wide) and in having a wing pattern of contrasting colours (subcostal area in Hyles�exilis with inner margin strongly indentated and narrower, subbasal and subcostal spots blend in a band with uneven margins, median band is yellowish white, lighter than that of the new species, postmedian band with pale veins, most individuals having an inconspicuous median area on the underside of hindwings). Genitalia differ in the shape of harpe (in Hyles�exilis it is inconspicuously curved, vinculum tapering at the distal end). Taking into account the above characters, Hyles churkini also differs from Hyles�costata, which is allied to Hyles exilis. If one just took into account the harpe of the valva, the specimen from the Mogoin River valley could be attributed to Hyles�exilis. Therefore, Saldaitis & Ivinskis considered that a detailed list of differences between Hyles�costata and the new species would be irrelevant. The new species also differs markedly from the other Hyles species found in Mongolia, namely Hyles�gallii, Hyles�hippophaes, Hyles�zygophylli, Hyles�nicaea and Hyles�chamyla (Saldaitis & Ivinskis, 2006). It gets dark very late in western Mongolia in June, at about midnight. The new species was caught between 02.00h & 04.00h in a small river valley covered with tall grass and bushes. The vegetation of this valley was very different from that of the surrounding area. The southern part of the Mongolian Altai region has been adversely impacted by economic and grazing activity. Overgrazed, barren steppe and semi-deserts with sparse grass predominate. The Mogoin River valley is hard to reach as the entrance into it is very narrow and filled with stones. For this reason, this valley is unsuitable for livestock pasturing or any other farming activity. This was the only habitat of this kind found in this region, with wastelands extending hundreds of kilometres around it (Saldaitis & Ivinskis, 2006). Mongolia: 30-31.v (Hovd Prov. ); vi (Hovd Prov. ; Gov'-Altai Prov.). Mongolia: Hovd Prov. (Elkhony-Ekhen-Tal, Bodonchiyn Gol (River) valley, 1200m (45°43'N 92°05'E); Ikh-Khavtag-Uul Mts., near Yargajtyn-Sajr Gorge, 1900-2150m (45°03'N 92°09'E); Dzhungarian Gobi, 20km N Zeegijn border post, 1400m (45°17'N 92°09'E)); Gov'-Altai Prov. (Mogoin Gol (River), south of Zuyl, 1920m (45°39'N 93°47'E)). The southern Altai Mountains of Mongolia (Saldaitis & Ivinskis, 2006) as well as parts of neighbouring Hovd Province (Yakovlev & Doroshkin, 2017), and, apparently, the Lake Toktogul area of the Tian Shan Mountains, Kyrgyzstan.